Our ability to extrude a wide range of flexible, rigid and rubber profiles has allowed us to work in conjunction with Comar Architectural Aluminium Systems to form a strong partnership to continually develop enhanced performance curtain walling systems such as the Comar 6 system. The Comar 6 system has been used in wide range of applications, including Farnborough Airport – Britain’s most modern business airport. 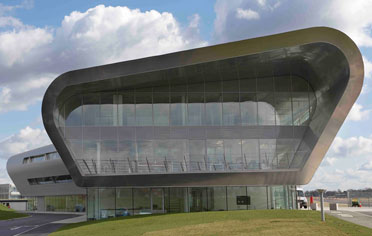 The flexible design of Comar 6 makes it ideal for complex facetted curtain walls as well as sheer glazed facades. In the terminal, Comar 6 spans the first and second floors incorporating three metre high panes of 6mm toughened glass. The use of the Comar 6 system contributed to the terminals elegant and minimalist appearance.